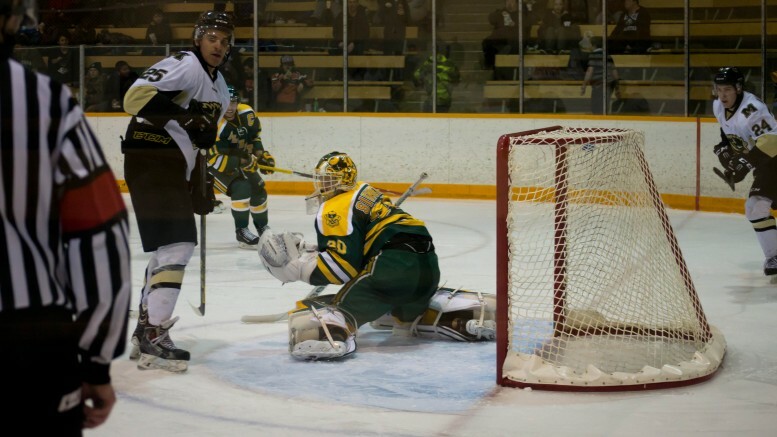 On Saturday afternoon at Wayne Fleming Arena, the University of Manitoba Bisons men’s hockey team played out a 3-2 win over the University of Alberta Golden Bears. The second game of the back to back was hard hitting and physical, with no animosity lost between the two teams. The visitors were determined not too have a repeat of Friday’s 7-4 loss, dominating in the early going. All that hard work came undone when Joshua Derko took a bad cross checking penalty 200 feet from his own net. The Bisons made the Golden Bears pay in the form of Jordan DePape, when four seconds into the Manitoba power play he buried a shot far side on Luke Siemens. DePape extended his point streak to an astonishing 13 games with the tally. Alberta would tie the game with less than a minute left when Kruise Reddick had a shot deflect off Bison goalie Justin Paulic’s shoulder and dribble into the back of the net. Lots of penalties filled the latter half of the frame, as tensions started to boil over from Friday night’s contest. The Golden Bears dominated the second stanza, as they peppered Paulic but only managed to get one shot past him when three minutes in Riley Kieser found the back of the net. Two minutes later, Warren Callis wristed a shot low blocker on Siemens to draw the herd level at two. After two periods, the visitors had registered 33 shots on goal, compared to the Bisons 13. In the third period, Alberta carried the play throughout again, dominating in every single statistical department except on the score sheet. The plucky Bison team managed to stay in the game with some fabulous saves from Paulic. In the dying embers of the game, DePape threw an errand pass to the front of the net and Shaq Merasty was the beneficiary, slotting the biscuit home past Siemens for the game winning goal.. Brett Stovin got the second assist on that play, and in turn extended his own point streak to 11 games. Paulic was the star of the show, making several highlight reel saves in the game. He was the main reason the herd stayed in the game all afternoon. The rookie talked post game about his performance and being able to beat the Bears twice on the weekend. The Bisons play a two game set at home against the Mount Royal Cougars next weekend, looking to continue their momentum.